Want to camp comfortably, but don’t own an RV? 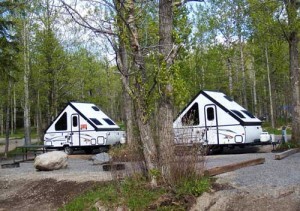 Rent one of our “onsite” RVs! No towing hassles, no mileage charges, no extra gasoline expense, no RV insurance fees, no set up or connections needed – it’s all done for you. Premier campsite with picnic table and private fire pit included.